Home remodeling projects are the best way to maintain a house while adding more value. Unfortunately, the number of solutions available for your project are nearly endless. How can you know what projects achieve the best results while avoiding those that just waste cash? 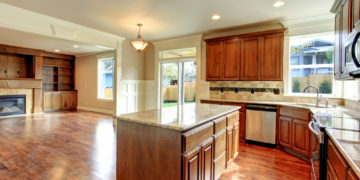 When you need better remodeling results, it helps to know you’ve hired an expert team of home remodeling professionals. Southern Home Renovations is the best team for all your home renovation needs. We help more Georgia homeowners achieve their best renovation results each day. Call us when you need to know that your home improvement needs are in the right hands. We strive for fast, accurate remodel results each time. Whatever remodel need you have, our team can make the most of any idea or budget. Whether you’re just looking to restore what you initially built or transform a room into something entirely different, we have the experience to handle it all. Whether you need to install a room addition or just work with what you have, we achieve the results you need each time. Call us for complete renovation services today! Basements all look the same when their first built. However, over time, you may need them to operate for different reasons. Whether you plan on converting it into an extra living area or you need to know your storage items remain safe, you may need to change how your basement behaves. When you need better basement remodeling services, you can always turn to us. We ensure that your basement gets transformed however you like. Whether you need to change the flow of your walkways, add new walls, or any other design choice, we are here for you! Call us for the dependable choice in basement remodeling services in Georgia. We get the results you need each time! Is your basement showing signs of aging? Have you been putting off those repairs and now they’re stacking up? Chances are when it comes to basement renovation, you’ll need a helping hand. There are plenty of things to repair, and much that can go wrong. If your basement isn’t performing as well as it should, we can renovate it all. Let us help you make your basement look brand-new again! The basement areas of most homes remain incomplete. That is because the basement doubles as your home’s foundation and only the bare bones still stand. However, not all homeowners are fond of the unfinished look. Exposed wiring, drafty cold spots, and dingy smells are all unwelcome in your house. When you need a completed finished basement, we can make the most of whatever space you’re working with downstairs. Whatever your basement needs to look its best, we can handle it all! We can transform any basement into a functional living area. Call today for your best basement refinishing project! The kitchen is among the busiest foot trafficked areas of your home. So, when it isn’t operating at peak performance, it can create a real inconvenience. Stop living with leaking faucets and cracked countertops. When you need a local team to renovate your kitchen for less, you can always depend on Southern Home Renovations! Why continue cooking in a kitchen that needs work? Call us for the best repairs around! It’s only a matter of time before a kitchen requires a little freshening up. We offer complete remodeling services to keep your kitchen looking great for longer. Is your kitchen in working order, but it just needs a little help? Perhaps a full refurbish isn’t in order, but refinishing might be. Don’t let the costs of home renovation projects prevent you from your best kitchen. Call us today for affordable refinishing solutions! Shiplap walls are a simple way to create a rustic or even a coastal appearance. By replacing your flat walls with a series of boards, it transforms a room’s style instantly! When you need fast and affordable shiplap installation, we are here for you! Call today to learn more about shiplap wall solutions! Barn doors appear striking in any room. And best of all, they go virtually anywhere! When you need hanging barn door installations, our team achieves the results you need. We hang barn doors wherever you need, whether it’s bedrooms, hallways, bathrooms, or more! Call Southern Home Renovations today for all your home remodeling solutions!